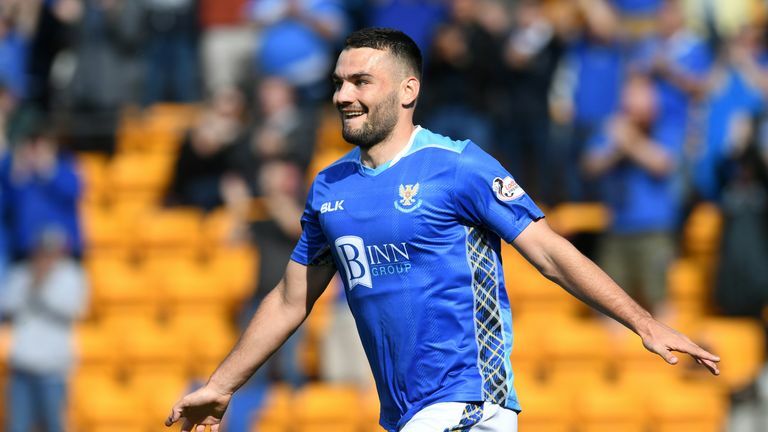 St Johnstone striker Tony Watt has been named the Scottish Premiership player of the month for August. The striker has scored six goals so far this season, including two goals in Saints' 4-2 win over Queen of the South in the Scottish League Cup, and has thanked manager Tommy Wright for helping him achieve his potential. St Johnstone sit fifth in the Scottish Premiership table having gained seven points from a possible 12 and winning back-to-back games ahead of the international break. Speaking to Sky Sports News: "The main reason I signed here was because of Tommy [Wright]. "I knew he wouldn't sugar-coat it. He would tell me if I have done something wrong and in the past I have been in bad habits which I didn't know were wrong. "Nobody told me 'yes that's right or not', but here he will tell me and then I can fix it. Before I couldn't fix it because I didn't know I was doing something wrong. "He's been brilliant and he's given me the platform and filled me with belief as well. You don't want to let him down." Watt has previously played for Celtic and Hearts in the Premiership. He signed for the Perth club in the summer as a free agent after leaving Belgian team OH Leuven and feels his time at the club has been his most valuable as a player. "I have said to a few people I have learned more in the past six weeks than I have in two years due to the fact I am playing games," he added. "When you are playing games you teach yourself what to do and what not to do and try and make it second nature. "You take out all the negatives, all the bad touches, all the bad decisions and put the good ones in, and that is what I feel like I have done. "I feel like I am improving every game and I am more comfortable every game." The 24-year-old has made only one appearance for Scotland - as a 78th-minute substitute in a 1-0 friendly win over the Czech Republic in March 2016 - but hopes to feature for the national side once again. Watt said: "I knew my aim for right now was not to be in the first international squad. "Anything after that then it's what I aim for and what I want to do - this one has came too soon for me I guess. I didn't expect to be called up anyway. "If I continue to consistently keep doing what I am doing, then okay, but I wouldn't say I deserved one this call-up. I am probably happy to give my body a rest after a gruelling month and a half."